on the banks of the Meramec..."
Oddly enough, the original impetus to control the Meramec River came from commerce, not from the effects of devastating floods. As early as the 1830's the Maramec Iron Works at St. James proposed a series of locks and dams on the Meramec to ensure keelboat navigability to ship their pigs of iron to St. Louis. This idea proved far beyond the technology of the time, due to the varied character of the river. The Corps first looked at the Meramec in the 1880's, but as late as 1930, no structural improvements were proposed. After major floods on the Ohio and Mississippi in the years 1927 and 1937, Congress authorized the building of up to 243 dams on the tributaries of these rivers to alleviate future flooding. Originally two dams, one at Pacific, and one on the Big River (a major downstream tributary) at Cedar Hill, were proposed. This was changed and expanded in 1943, moving the Pacific dam to just above the mouth of the Bourbeuse River (another tributary) and adding a third dam on the Bourbeuse at Union. Public hearings were held in 1949 on these proposed dams. Local opposition expressed at these public hearings, and backed by congressmen held off any action until 1958, when a private organization, the Meramec Basin Corporation, was formed to see what could be done to alleviate flooding. Their study, released in 1962, promoted the idea of a dammed Meramec as a twofold lake recreation and flood control project with one site chosen from six alternatives. After submitting their findings to the Corps, the Corps replied with their own updated plan in December 1963. In place of the three dams were 31: two each on the Meramec, Bourbeuse and Big; twelve on lesser tributaries, and twelve in the headwaters region of the river. Despite disapproval from federal conservation agencies, state officials and the newly renamed Meramec Basin Association appealed to Congress, and this plan was authorized in 1966, at a estimated cost of $236 million. Land acquisition began in 1968 for the Meramec dam at Sullivan, just upstream of Meramec State Park, to be followed shortly by those on the Bourbeuse and the Big. Nineteen sixty nine saw the beginning of organized opposition to the Meramec project. By 1972, what had been an enthusiastic but not well organized effort against the dam crystallized with the filing of a Sierra Club lawsuit against the Corps. This lawsuit dragged on for three years until the injunction against the building of the dam which the lawsuit asked for was thrown out of court in 1975. Those three years bought time, as the tide of public opinion began to turn against the building of the dam, both locally and in St. Louis, where many of the area's tourists lived. 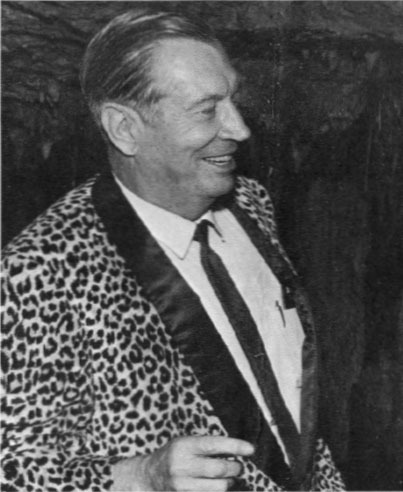 Lester Dill, then owner of Onondaga Cave, turned his initial approval to a media blitz against it when he discovered the lake pool would fill the Big Room halfway up the Twins. The passage of the Endangered Species Act in 1973 brought Indiana bats, a listed species which roosted in riverfront caves, into the litigation and then mitigation concerns. Dill also filed suit based on the status of the navigability of the Meramec River from the mouth to Maramec Spring. The work of acquiring land, and preparing the dam site continued, despite geologic arguments against it: namely that the left dam abutment was underlain by 5 known caves, with clay fill extensions of varying thicknesses. 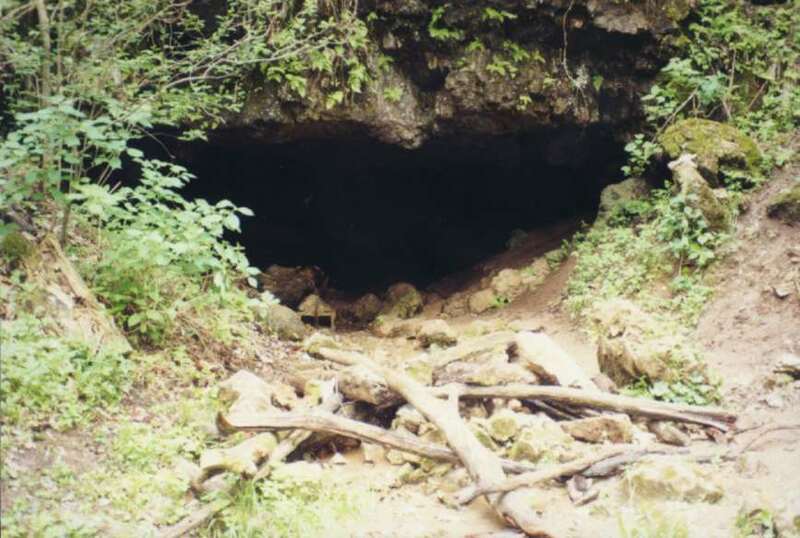 Moore's Cave, previously unknown and under the downstream edge of the proposed earthen dam, was discovered ninety feet into a supposedly solid ridge, with cave passage fifty feet high. The Corps proposed to grout (or fill with cement) the hollows under the dam and its abutment; opponents, most vocally Don Rimbach, who was a geologist employed by Dill, argued that the impounded water would wash away the clay fills, rendering the grouting useless. The Union dam on the Bourbeuse was removed from the project for conservation mitigation reasons in the summer of 1975. This was considered a setback for the proponents of the dam, who until this time were fairly assured of ultimate victory. Both sides of the issue then began a game of political hardball, resulting in hurt feelings which persist twenty-five years after the resolution of the issue. Cavers from the St. Louis and Meramec Basin area began a frenzied inventory and mapping of all caves along the Meramec, at the same time Army Corps engineers attempted to locate them as well, although for different reasons. Meramec Valley Grotto established the Meramec Conservation Task Force in September of 1972 with many members involved in mapping caves, doing research, writing letters, and organizing publicity events against the dam. St. Louis University Grotto members (some working under contract with the Corps, and some working against the project) spent many weekends mapping caves, and identifying known habitat for the Indiana bats which would be flooded by the Lake. Rimbach was a member of the Middle Mississippi Valley Grotto, and those cavers helped on his field and research trips. 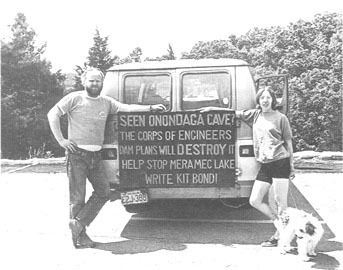 In 1974, The Missouri Speleological Survey organized the Meramec Valley Symposium, bringing together interested environmental scientists to present findings of possible environmental damage as a result of the successful closure of the dam. More questioning of the viability of the Meramec Lake project came in June of 1976, with the failure of the Teton Dam, in Idaho, whose construction was of a similar style to that at Sullivan. By that fall, with the election of Jimmy Carter as president and John Danforth as U.S. Senator (both politicians opposed to federal dam projects) Sen. Thomas Eagleton of Missouri and a member of the Senate appropriations committee delayed funding until the issue of whether to build or not build the project could be decided by public referendum. After the project was put into further limbo by making Carter's list of federal water projects to be discontinued, cost overruns began to escalate anticipated costs, ironically, since delayed funding had rendered the project dormant. The Missouri legislature set the referendum Sen. Eagleton had called for to include the 12 counties in the Meramec watershed and surrounding region on August 8, 1978. The final tally showed the area residents opposed to the dam project by 64%. The project was deauthorized by President Ronald Reagan on December 29, 1981. One of the effects of the Meramec Lake project was the restructuring of public land in the area. 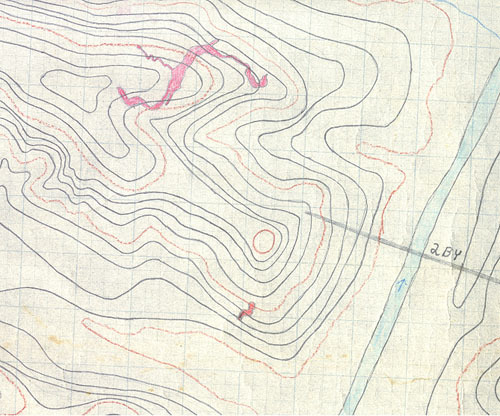 Originally, the section of the park containing Hickory Ridge and Mushroom Cave was transferred to the Corps for their use, although Meramec State Park would have continued to exist. After the deauthorization of the dam, the state was given back much of the land which had been transferred to the Corps, and was also given "first dibs" on other acreage deemed significant before it was set at public auction. Meramec State Park acquired the Hamilton Valley in this manner. In another trade, that portion of the park which lay directly across the river, and which had never been actively developed was transferred to the Missouri Dept. 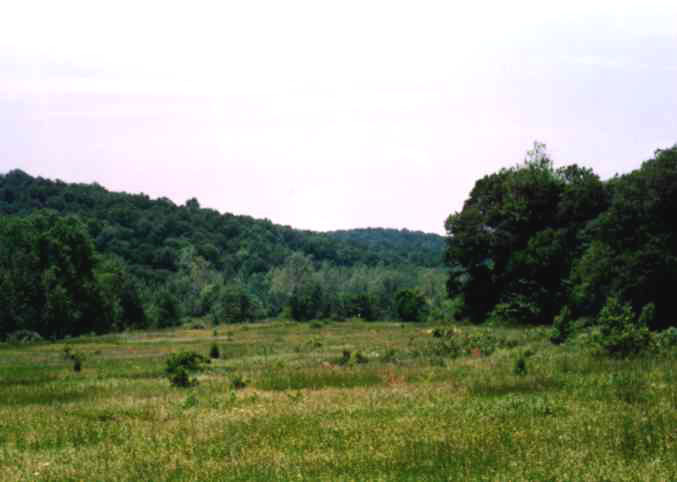 of Conservation for use as a State Forest, or Conservation Area, as they are sometimes called. 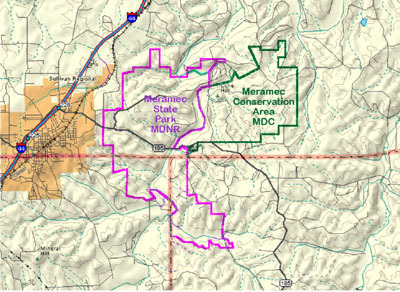 The net result is a Meramec State Park of roughly the same size as pre-Lake project--only the specific acreages are different. Although deauthorized and somewhat a closed chapter of local history, the Meramec Park Lake Project is still a sensitive subject amongst some of the locals in the Sullivan-Bourbon-Leasburg area. As recently as 1998, reviving an upper Meramec basin reservoir as a solution to increasing water demand due to urbanization was heard proposed. However, in the years since deauthorization, a thriving tourist business has grown up along the river, based on canoeing, fishing and river pursuits. Thanks to Don Rimbach for input for this article. For further information, Passages of a Stream, by James P. Jackson, University of Missouri Press, Columbia, MO, 1984, is a book length treatment of the topic. Also recommended is Damming the Dam: The St. Louis District Corps of Engineers and the controversy over the Meramec Basin Project from its inception to its deauthorization, by T. Michael Ruddy, USACE document 92-43426, 1992. Portions of the above were published in the 1997 NSS Convention Guidebook, National Speleological Society. 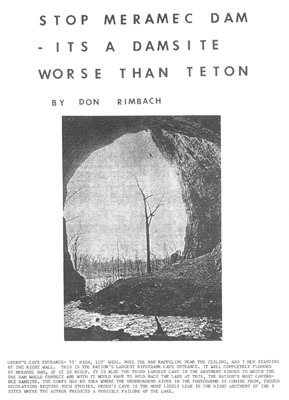 Photo of Don Rimbach by Robert L. Taylor from that publication. Revised June 8, 2003.